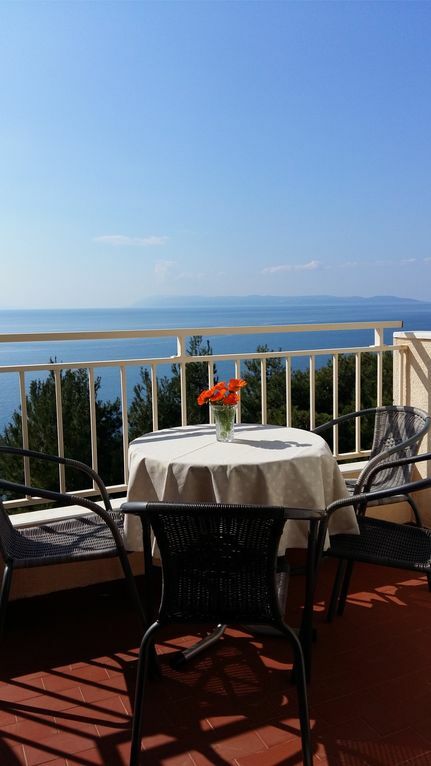 Ideally located , very quiet , in the heart of the Makarska Riviera .. near the Biokovo Nature Park, (only 10 minutes). You can easily visit Dubrovnik ( 140 km ) or Split ( 60 km ) and Trogir (75 km) all under the protection of UNESCO . You can also visit the beautiful islands of Hvar , Brac and Korcula, by yourself or take a few boat trips. There are also nice to visit the waterfalls of Krka and Plitvice Lakes ( 125-250 km by highway), and other well-known places . Ideal location only steps from the beach yet private and quiet. Really unique! Great views from balconies in every room! Clean and well maintained, with all amenities, including air-conditioning. Rooms are sunny and spacious. Shopping, restaurants and transportation all within waling distance. Ideal for family vacation. Alida is a a kind and gracious host. We are planning to visit again and would recommend this apartment to anyone looking for a comfortable and convenient base for exploring Croatian coast. Overall great value! Nice and fair priced Apartment. Good Location! Nice and fair priced apartment. Friendly owner. We had a good time there. Good location close to the sea. Many restaurants around and cool people. I can recommend to stay here! Wonderful, hospitable hosts Alida and her mom. Everything was perfect. Vernemsya.Budem necessarily recommend to their friends. Thanks,Nikolay, hope to see you again! "Hallo.We was here in July. It is a very comfortable place.If you need a quiet holidays it is for you.Apartaments is near the sea and from the balcony you can see the beautiful view (sea and mountains).Owner is a nice woman. The house is big and clean.I think it is good correletion of price and quality.I reccomend this place for unforgettable rest." access to the water was just 1 minute walk down. And the balcony was great to sit and eat dinner when the sun was going down! "We enjoyed our stay in Alida''s apartment and in Podgora very much. My wife would argue that we enjoyed it too much: our three children (13, 11, 9) and I are made for the sun and water; my wife is made more for cool mountains and meadows. Air conditioner, WiFi, LCD TV, washing machine and enough cooking utensils to get by - the apartment has everything you may need. It was clean and well maintained. The best bit is/was the owner, Alida (and her family). Gracious, informative, helpful. We don''t wish to put her under pressure to perform, but we enjoyed the cakes she baked. We were also relieved when she helped us when our youngest came down with a 24hr virus. If you''re looking for a holiday with no worries - go to Podgora - stay with Alida. We''re looking to return and would recommend this apartment very strongly."